Freeport (population 26,443) is located in northwestern Illinois in Stephenson County, roughly 20 miles south of the Illinois-Wisconsin border, and 25 miles west of Rockford. US Route 20, along with Illinois 26 & 75 connect the city with the rest of the region, as does a line operated by the Canadian National Railroad. The history of the community is tied to both Indian and immigrant history, originally being called Winneshiek, before changing its name to Freeport due to a free ferry that was operated by Tutty Baker across the Winnebago River. Baker was one of the first immigrants from Germany via the state of Pennsylvania that settled in this northern Illinois town, starting in 1827. When Stephenson County was formed in 1837, Winneshiek became Freeport on 1838 due to the generosity of Baker, who had also set up a trading post on the river. Freeport grew quickly as it could be reached by stagecoach in those days from Chicago & had erected a courthouse and school within a few years. Freeport was also a significant stop during the Lincoln-Douglas Debates in 1858, holding the second of the seven debates between the two senatorial candidates which would set the stage for the 1860 Presidential campaign that Lincoln would win. The community is the birthplace of columnist Louella Parsons, basketball star Deacon Davis of Harlem Globetrotter fame, Black Entertainment Television (BET) founder Robert Johnson, football player Preston Pearson, and television actress Calista Flockhart. St. Mary High School would open its doors in the fall of 1895 as a parish high school under the direction of the Dominican Sisters of Sinsinawa, Wisconsin. The Rev. William A. Hoban was responsible for opening the school, which had five students graduate in the spring of 1897. The school used the same textbooks and curriculum that was used at Freeport High School, but the only difference was that religion classes were offered at St. Mary's. 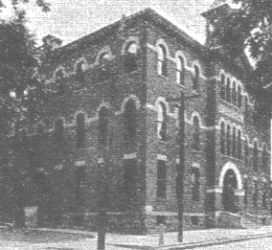 A new building with science labs was ready by 1899 for the first parochial high school in Stephenson County. Unfortunately, the school would not last beyond 1902 when it closed. The reasons have been lost to time, and there is no longer a school in the parish. Only the church remains today to serve Catholics in Freeport. Even though St. Mary's has been closed for more than 100 years, it doesn't mean that information about the school cannot be found. There may not be an alumnus of the school remaining to recollect their days at the school, but is always the possibility of information in a book somewhere in a library or even in an archive.